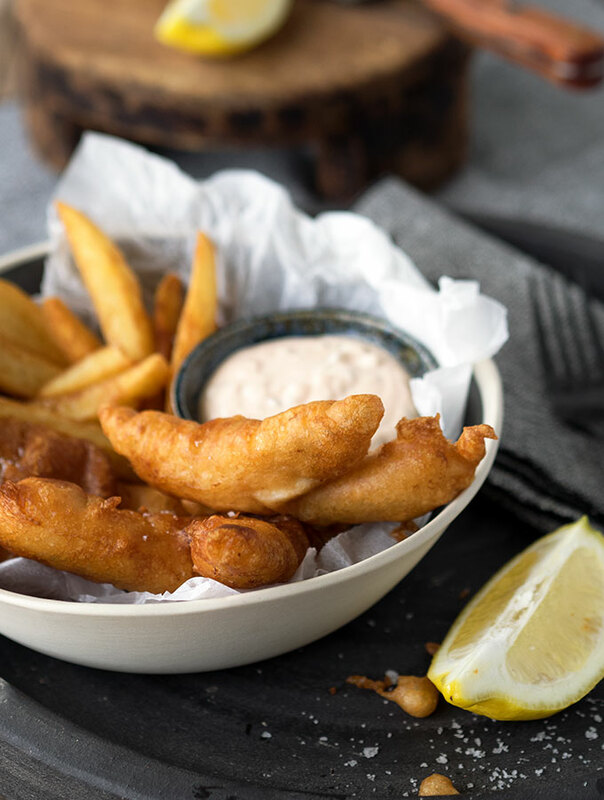 Ginger Beer Battered Fish and Chips is a tasty out of the box recipe. And why not if you are going to all the effort of frying fish and chips at home! Hands up who doesn’t make fish and chips at home. I know I generally don’t, quite honestly who on earth could be bothered. There is oil and then the fish, plus making your own chips on top of that. 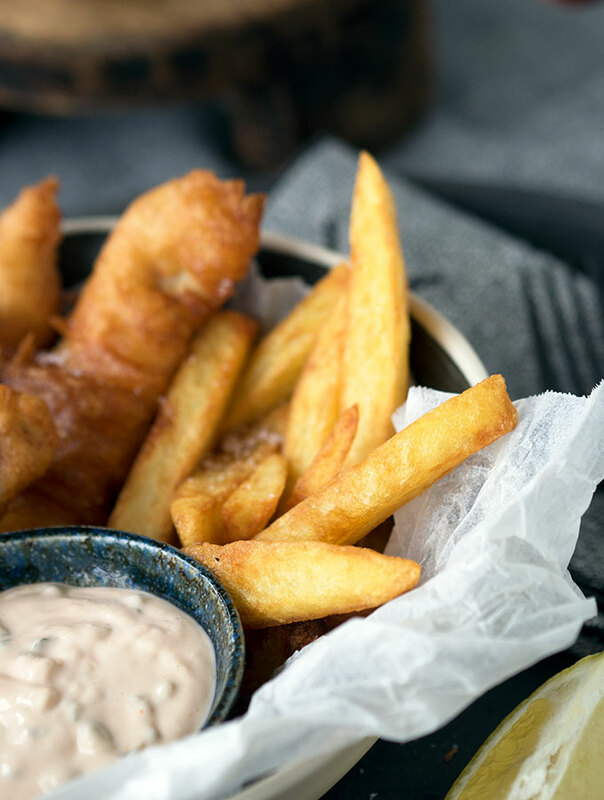 It’s much easier to head to your local fish and chip takeaway or the pub for your fried fix. I say I generally don’t but then every so often an urge comes over me to deep fry some fish at home. A stupid bloody urge to be honest, but it does. 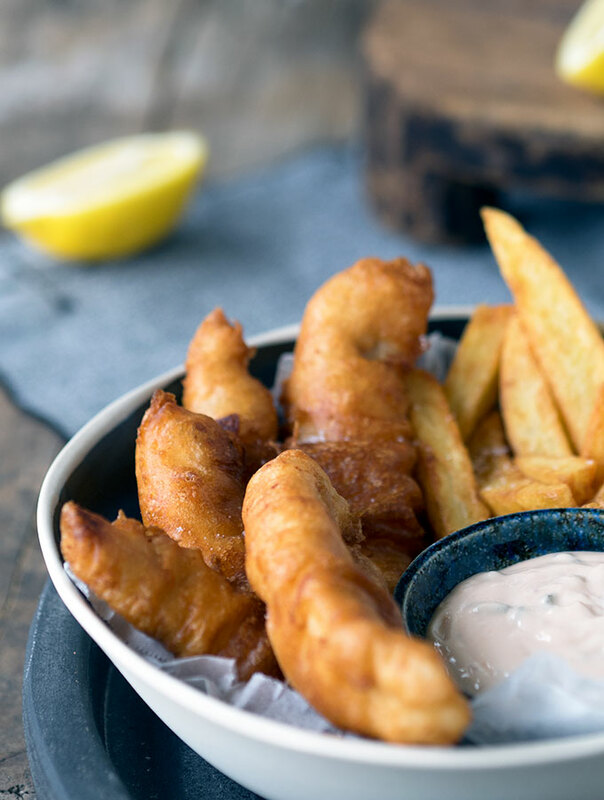 There is one major bonus of dipping fish in batter and deep frying it at home. It’s the batter, you have complete control and creativity. That my friend is my draw card to homemade fish and chips. For around six months now I have wanted to make ginger beer battered fish at home. A non alcoholic take on beer battered fish. You could use any bubbly elixir of your choice. Champagne battered fish and chips anyone? It’s all about the liquid being bubbly and cold. Make sure your ginger beer is as icy as you can get it. The batter for ginger beer battered fish has sweet notes once cooked. The first time I tried it I was a little surprised. Luckily the flavour marries very well with flathead fillets. The sweetness accentuates the subtle flavour of the fish. Don’t have flathead in your part of the world? It’s okay, you are missing out, but you will survive. The bonus to this is, you can use fillets from your favourite white fish. You are more than welcome to scratch the chip making session and put some frozen fries in the oven instead. Between you and me, this recipe was nearly accompanied by gherkins and my potato salad in the photos. But chips I did fry, just for you. I decided I was going to try Heston Blumenthal’s triple cooked chip recipe. What we ended up with was Heston’s triple cooked chip recipe if he was working out of a domestic kitchen and couldn’t be assed. I do love the theory behind his recipe. What I didn’t like was putting fried potato chips in my freezer to chill down before the final fry. My nose was already having convulsions at the thought of my freezer smelling like oil. My simpler triple cooked method is what we ended up with. They are crunchy, but so is a packet of frozen fries thrown in the oven. Please don’t let me deter you from frying up your own chips, there is a satisfying reward to it when you are serving them alongside your ginger beer battered fish. It isn’t like you don’t already have the hot oil at the ready. A basic tartare sauce was what I had envisaged serving the ginger beer battered fish with. It was really an afterthought on the day. I hadn’t planned on any sauce at all, completely slipped my mind. I was probably still trying to navigate Heston’s time consuming triple chip recipe process. I didn’t have any parsley, therefore no tartare sauce. I could have made a classic marie rose sauce, but I wanted something with a little more umpf. This is how we ended up with Sara’s Tasty Sauce for Fried Fish. Basically I couldn’t think of a name for it, my creative juices weren’t flowing at all. The sauce has a great kick of horseradish, hints of a classic marie rose, and given some more bite with finely diced cornichons. It’s a very tasty sauce if I do say so myself. It’s bold enough to slather on the ginger beer battered fish, yet doesn’t take away the delicate sweetness of the fish and batter. As mentioned earlier, the fun part of frying fish at home is you can be creative with the batter. Why not experiment? Use different kinds of fizzy liquid, mix through herbs, spices, zests of citrus, the options are endless. Just get creative! That’s the joy of cooking at home. 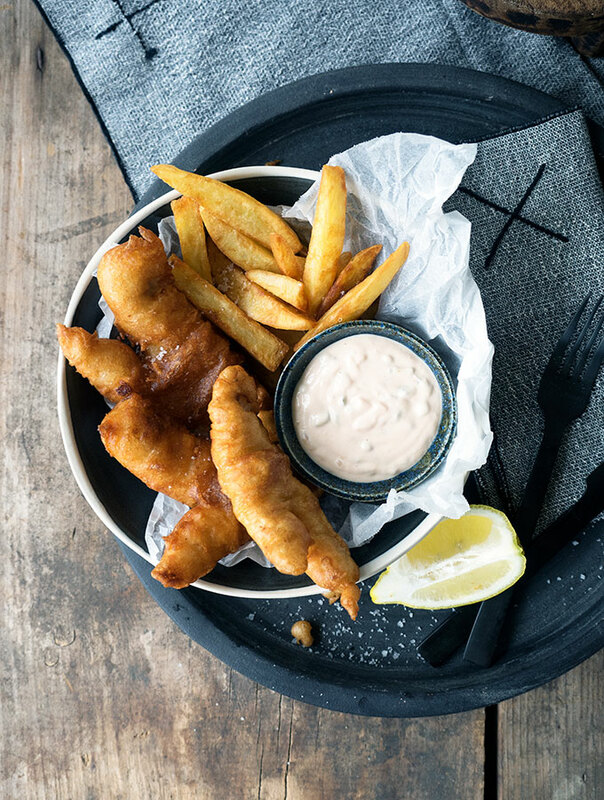 Ginger Beer Battered Fish & Chips is a lovely twist on beer battered fish. Perfect with homemade chips and my tasty sauce. Check flathead fillets for any remaining small bones or fish scales, remove if found. In a medium size bowl place flour, baking powder and cornflour. Whisk in ginger beer and set aside. Prepare your deep fryer if using one and bring oil temperature up to 180 deg C (360 deg F). If not using a deep fryer, I don't, use a wok. Place oil in wok to a level that is deep enough to deep fry a couple of fish fillets at a time. Dust a couple of fish fillets with flour and shake off any excess. Dip fish fillets in the ginger beer batter and place in hot oil. Fry until golden and cooked through. Serve with chips and my tasty sauce. Peel potatoes and cut into fingers your desired thickness for chips. Place in a large bowl of cold water as you cut the potatoes up. Drain water from the bowl and fill again with cold water. Leave chips to soak for 20 minutes. Drain chips and place in a large pot with cold salted water. Bring to the boil and cook until tender. Remove chips from the pot and drain well. Place on a cake rake in a single layer and leave to cool and dry for an hour. Heat oil to 180 deg C (360 deg F) and fry chips in batches (do not overcrowd the fryer/wok) for a few minutes. Remove from heat before they start to brown and place on kitchen towel in a single layer on a cake rack. Leave them to drain and cool while you make your beer battered fish. Once you have finished making preparing your fish. Place chips, in batches, back into the hot oil and fry until they are golden. In a medium bowl place mayonnaise, horseradish, tomato sauce (ketchup) and cornichon. Start your recipe for your chips first if you are making your own. Do not overcrowd your fryer or wok when deep frying fish. Fry a couple of pieces at a time and then leave to rest on kitchen towel on a wire cooling rack while cooking the rest.